7 | Architect: Dermice Architects | Designer: Anna Fedyukina Grey slate walls in the bathroom offer a clean surface for the sunflower and forest hues to shine again, while the multi-coloured pattern continues through distinctive tiling. 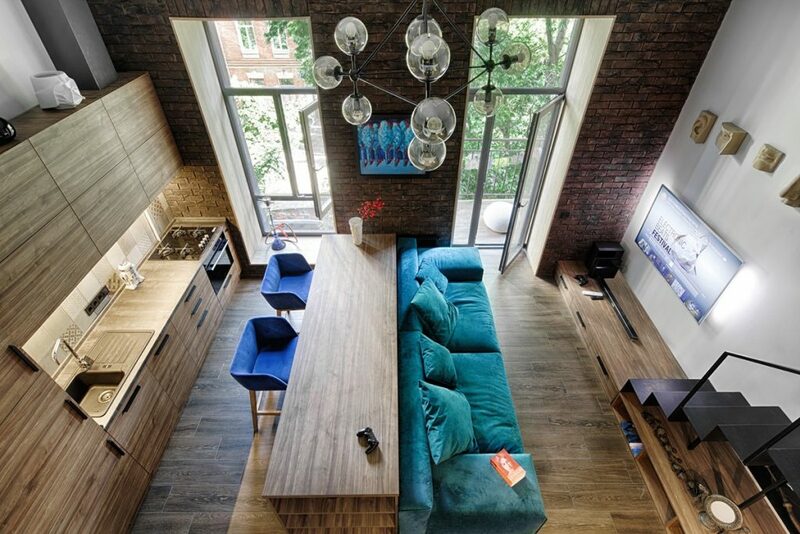 Inbuilt honeycomb detailing dilutes the impact of the main colour palette within the small space. 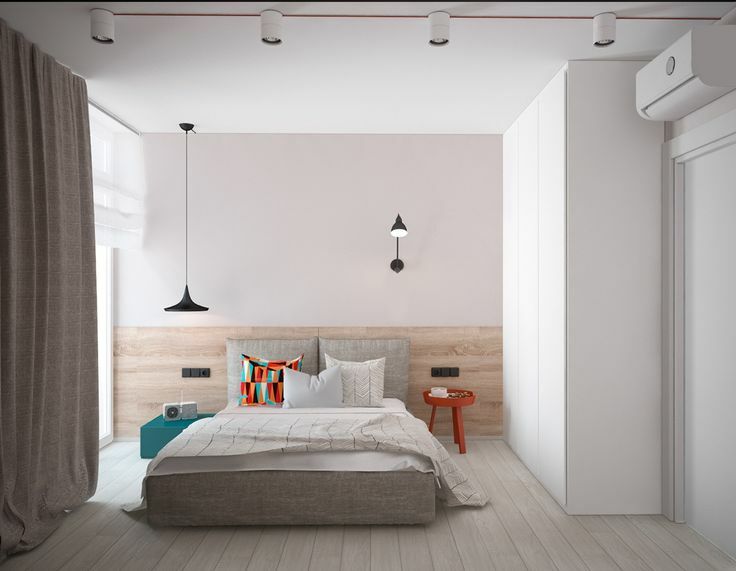 3 | Designer: Mariia Movchan A minimalist bedroom offers a respite from the art deco theme, while subtly referring back to it. Muted teak floors with burnt orange and teak fixtures mark either side of the master bed, while boxed shelves in the same colour offer storage and a point of difference. Walking past the confetti, the larger statement wall screams space, through the ability to hold a large block colour. Four paintings forming a block add an art deco feel, which is confirmed by the 70’s style mosaic tiles forming a ring around the kitchen. Through the kitchen and living spaces, patterned details are turned up a notch. Light wood panelling and charcoal-coloured benches ground the space, while stencilled lights and thin-wired stools provide a welcome pairing with abstract artwork and mosaic detailing, adding flavourful aspects to the main guest area. 11 | Designer: Ivan Yunakov The brick façade continues into the master bedroom, where warmer tones come into play. A beige cover with terracotta and fawn cushioning is a muted place to rest one’s head, beside a mosaic light that ties in the kitchen tiling and iron staircase. From the other side of the hallway, large white cupboards act as a wall, but also provide space. A small teal seating space offers welcome to new visitors in a visually-appealing triptych layout. 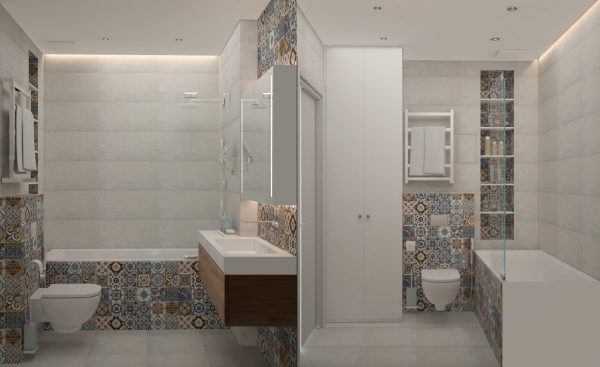 Minimalism in the bathroom is made original by the 70’s mosaic, a memorable tie from the kitchen. Spacious white surfaces are accentuated with mosaic inlets and facades, grounded by the wood panelling underneath the sink. Creating the illusion of space with high-ceilinged sliding doors, the long white chiffon drapes let in light, while the study outside adds space to the room. The long wooden desks within the study make the most of an oblong space, with black wall light fixtures and block art continuing the lounge’s theme. 10 | Designer: Ivan Yunakov To the right, white walls offer a respite for wardrobes and bookshelves, which offer drops of colour against its simplicity. A cast iron staircase holds a frame and lets the chair, bust and painting details do the talking. 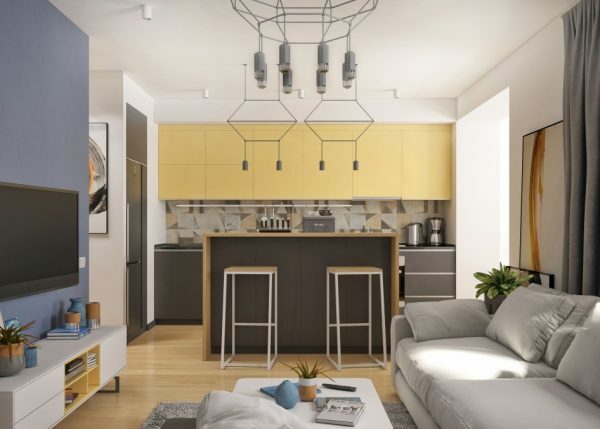 2 | Designer: Mariia Movchan Teal tones tie together the kitchen and lounge spaces, which lie in more muted tones to let the mustard act the hero. White teak flooring adds neutrality, while the extended confetti wallpaper and black wall lighting add connecting detail. Small apartments offer a homely haven from the outside world – but also less space for decorative self-expression. Bedrooms, lounges, bathrooms and kitchens are not afforded the luxury of space to accentuate fixtures, features and panelling; it is here that crafty design innovations take centre stage. Clever colouring, supporting accents and mixed-purpose spaces are the hero in these apartments and hotels. 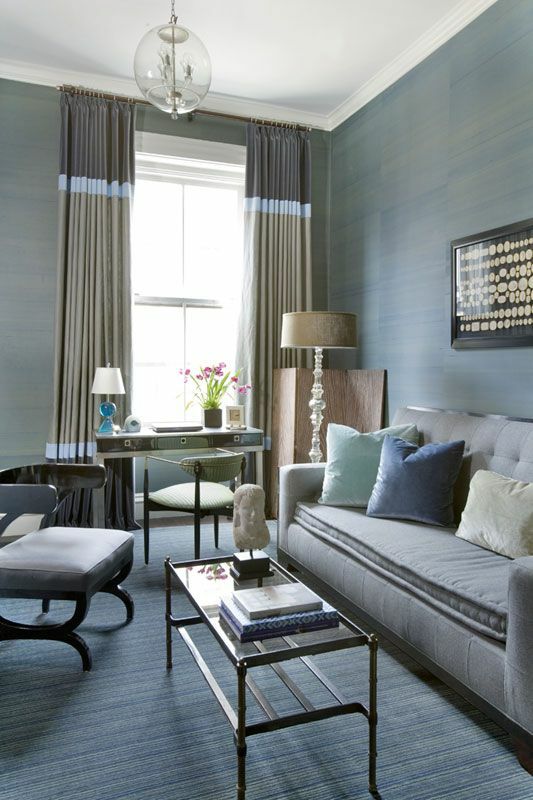 Sleek storage spaces hide behind large art deco pieces to bestow breadth to limited room. 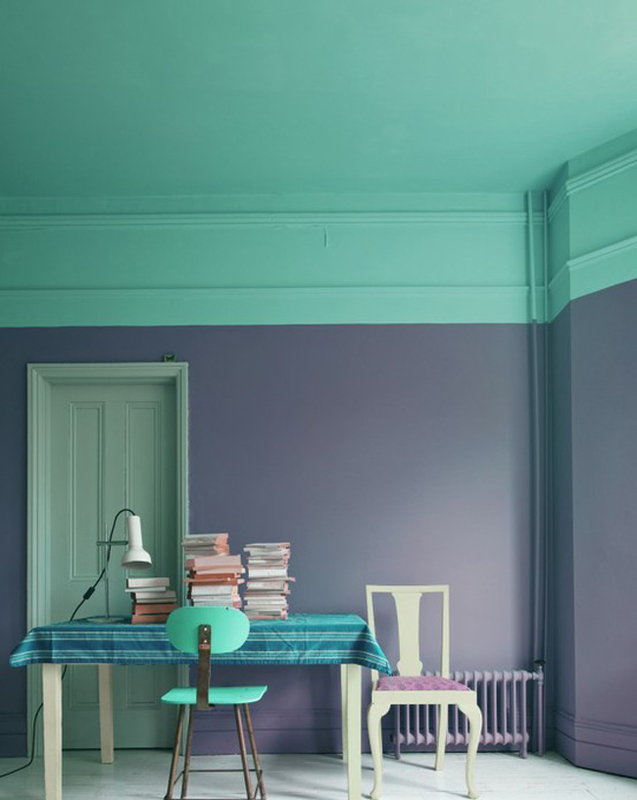 These small spaces, located across Europe, show square metres are not required to inspire – but ingenuity and colour-blocking often is. 6 | Architect: Dermice Architects | Designer: Anna Fedyukina Patterned carpets incorporating more muted hues of forest and charcoal support the transitions and offer a contrast to black and sunflower-hued highlights. 9 | Designer: Ivan Yunakov A 49-metres-squared loft in Kiev by Ivan Yunakov (http://yunakovdesign.com) also uses signature shades to create harmony in cosy spaces. 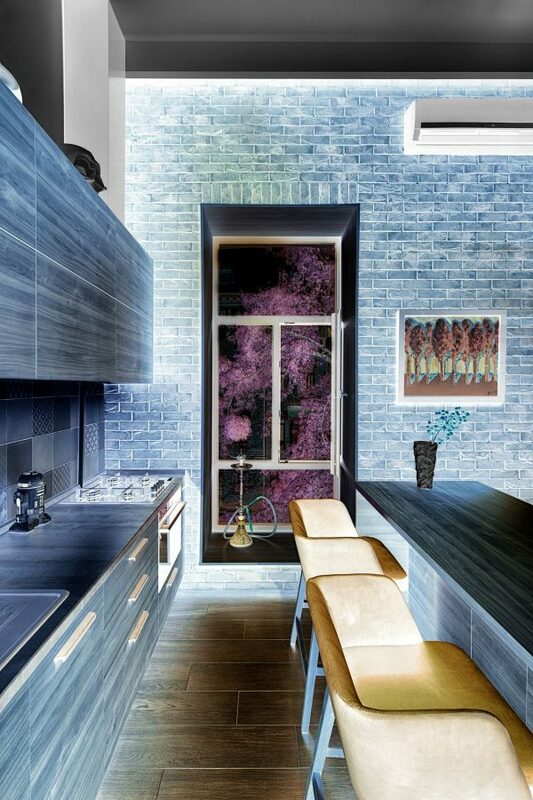 High-ceilinged brick and panelled wood fixtures afford the height for long-lined doors, which are stretched horizontally by similar-shaped benches. A turquoise couch with electric blue suede single seats offer seats to look at bauble lighting, the only rounded fixture in the room. 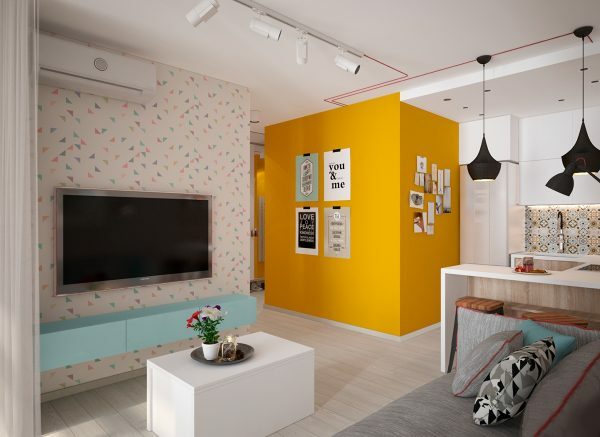 1 | Designer: Mariia Movchan This small apartment in Kiev is a perfect starter. Opening the door on a bold mustard wall, confetti wallpaper greets the eye on pale teak floors. 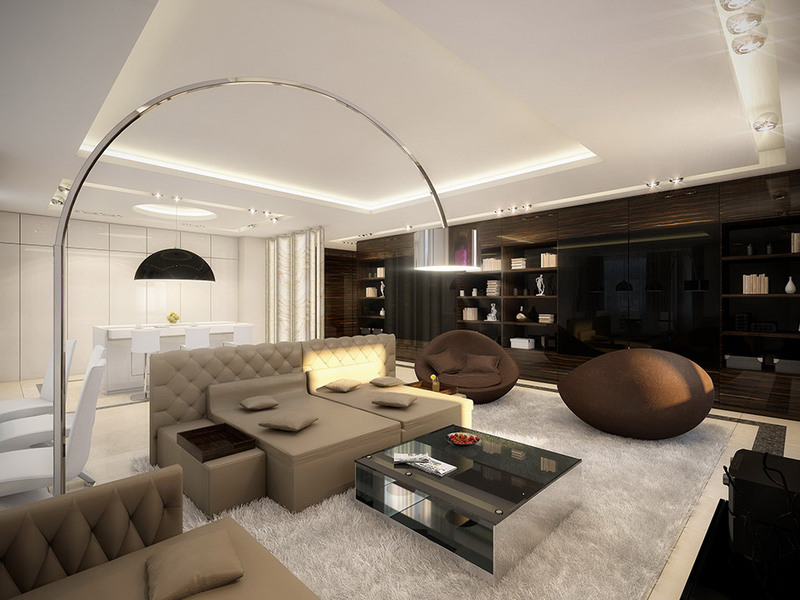 A focal point of interest in two black hanging lights offers promises in the larger space beyond. 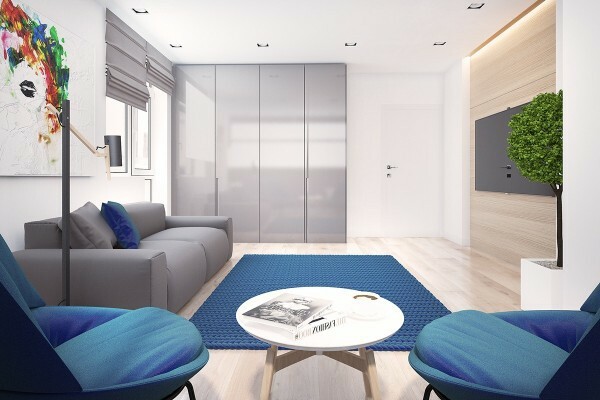 8 | Designer: Ivan Haiovych A similar modernist look in Rivne, Ukraine, has helped add spaciousness to a small apartment. Pale shades of light wood, light grey and darker grounding charcoal add detail without losing head space. Alternative levels of shelving in the bedroom and bathroom add a design focus while providing storage. 5 | Architect: Dermice Architects | Designer: Anna Fedyukina Links between the main reception area and bedrooms are defined by surrealist sketches, which hark back to the lives of the students residing within its walls. 4 | Architect: Dermice Architects | Designer: Anna Fedyukina A hotel can have the same cosy feel, with a slightly-less personal touch. This concept for Coordinat student hotel in Turkey uses sunflower-shade colour-blocking with a similar shade of flowers to add flair to a background of white walls and light wood.